I laughed. It was a four handled wheel with a simple grindstone, and I knew I could easily spin it. I walked up to the wooden handle and pushed, a bit off balance. Nothing. It didn’t budge. My friend laughed behind me and I sighed loudly. “Alright, this time I’m really going for it,” I thought. I dug my feet into the ground and pushed with all my force, and slowly it started moving. Inch by inch, I pushed, groaned, and forced the wheel. Step after step, I put all my strength into moving forward. Within 5 minutes, I had the wheel halfway around. I wanted to stop and catch my breath, but I knew that I had to keep going. After my first loop, the wheel started to become easier to push. By the 3rd time around, the wheel was moving without any pressure and I was just guiding it with my arms. I was covered in sweat from the first two loops, but I started to see that the grueling beginning was worth something. And I couldn’t quit now. By the 5th loop, I was running. By the 7th loop, I had hopped out completely. The wheel was turning all by itself. Spinning and spinning, it was now unstoppable. I grinned at my friend. “Now that’s a flywheel,” he said. In the business world, that flywheel is what we call Traction. It’s the key for marketing, but one of the biggest mistakes that early stage SaaS companies make is focusing too much time early on into engineering and not enough into creating this marketing traction. Well, it’s grueling, it’s tough and sadly most of your marketing experiments are going to fail. Testing and tweaking early on gives you time to find a channel that can be that right step to attracting your target persona. And once you have something working, you can begin to push forward to dial it in and scale it up. What it really should be about is creating a memorable brand and voice, demonstrating product values, increasing product usage and customer happiness. It goes so much beyond the traditional lead generation and content marketing ideas. Traction with the right channel can solve all of this. 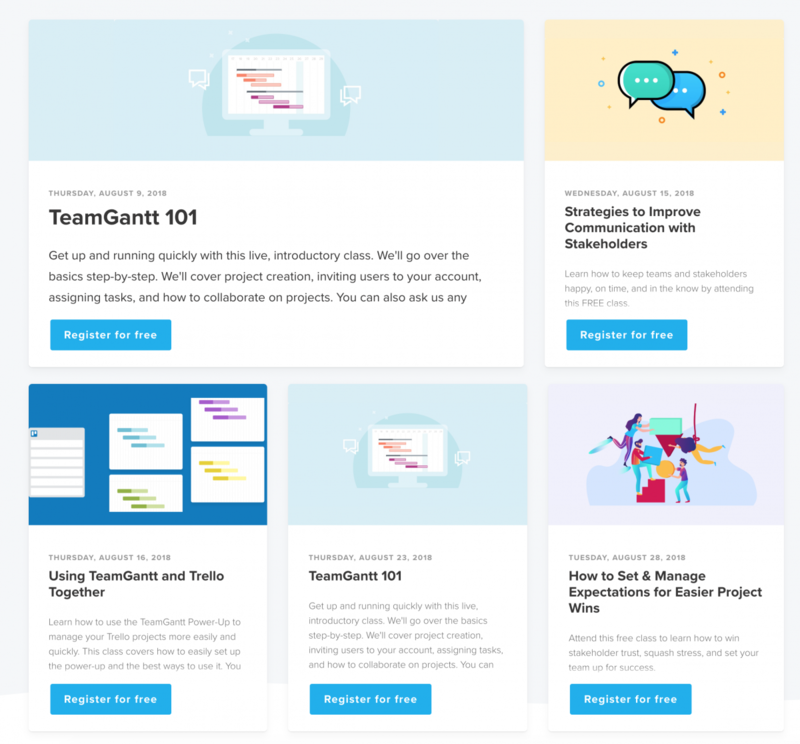 I recently was chatting with the marketing team at TeamGantt, an incredible SaaS that put fun into project management with their online software for project scheduling, about their own journey. We talked about the early days and how they often saw their stickiness and retention as two very separate entities. But, when they went to solve one of the problems, they actually solved both. How? Well, they stumbled upon webinars! At the very start of their webinar journey, TeamGantt was faced with a few major challenges: as a relatively young company back then, they needed to increase stickiness. The other challenge was product education with the goal to reduce churn. Testing early and often to find the right marketing channels, the company decided to try doing a webinar three years ago (just before we launched Demio! ), initially for the purpose of product education. At the time, their customer success team stepped up to handle it, and they did short presentations helping their users perform some specific things with the software. They were simple to start, and those webinars were done weekly, and sometimes more seldom, depending on the need. As the company kept on building their brand and developing the product, they created features that users weren’t fully aware of. TeamGantt saw some of the users contact customer support wishing to cancel their subscription, because they needed features that they had no idea were already there. This prompted customer success team to run webinars, showcasing the new features and how they can be used. It was just a test at first, but quickly those tests turned into traction! Naturally, TeamGantt produced a lot of product-related materials – video walkthroughs, help articles and so on. But, their users still preferred the white-glove type of service and real-time interaction, where they could directly communicate with a member of the customer success team and have their questions answered related to their specific case. TeamGantt wanted to drive further the one-to-many communication approach and education, as they wanted to continue building their brand recognition. So the company decided to put much more effort into webinar marketing, bringing it up to current levels and tying the revenue directly to these efforts. This was the time to really scale things up! It really wasn’t hard for TeamGantt leadership to get on board with webinar marketing. As a company free from mundane corporate processes, TeamGantt is able to quickly test things out and make fast decisions based on results. When the initial webinar efforts of the customer success team led to decreased churn and, as a result, increased retention, it was clear for TeamGantt that webinars were worth exploring further. Now TeamGantt does two webinars a week, sometimes three, depending on their content schedule. These days TeamGantt still does product education webinars. One of their weekly events is called “TeamGantt 101” and is for new users who need help and guidance to use the software. The major change is that now TeamGantt’s big focus is on general education webinars. Their target audience largely consists of project managers, so TeamGantt educates them on different topics related to that: topics that help these people improve their project management skills and get better results. Attendees can always learn something new and get actionable takeaways, regardless of whether they are a TeamGantt user or not. The company’s goal here is that once the prospect has been educated enough, they will want to become a paid customer. The software is also being used in all of the presentations to illustrate how specific actions and tasks can be performed. Generally, this type of educational webinars does wonders for demonstrating expertise and establishing thought leadership. It’s natural for people to buy services from companies who clearly know their subject and know what they are doing. TeamGantt’s educational webinars are mostly intended for users in the middle of the funnel – the ones subscribed to the free plan. The goal is to showcase the benefits of the software to them, driving them further down the funnel. At the beginning of each of those webinars TeamGantt expresses their appreciation for attendees’ time and promises a special discount if they stay until the end of the webinar. When the moment comes, they provide attendees with a discount code, advertising an annual package, for which the coupon would get them four months free. After the webinar, TeamGantt uses Demio’s integration with Drip to send out webinar replay links and discount code reminders. One day later they send out replays and discount code to everyone who registered, but didn’t attend. All of this happening on auto-pilot. Originally TeamGantt was using GoToMeeting for their webinars. They were unhappy with the user experience and the fact that attendees were forced to download the software. It was clear that this was also affecting the webinar attendance rates. So, TeamGantt decided it was time for a change and did the research to find a new webinar software. That’s how they discovered Demio. Additionally, they were impressed with the quick and easy setup and wasted no time to get things rolling. As a result, TeamGantt saw an average 15% attendance rate increase after making the switch to Demio, bringing their overall attendance rate to incredibly successful 35% – 45%! TeamGantt considers webinars as one of the ways to provide exceptional service to their customers. They appreciate being able to interact in real-time with them and answer questions that the users might have. TeamGantt also goes the extra mile and makes sure to address the initial pain points from which the questions originated. In addition to these benefits, TeamGantt uses questions and discussions taking place during webinars to plan their content and the topics they will be covering. Webinars provide a great learning opportunity for TeamGantt to communicate with their customers and get invaluable information from them. I walked away from our conversation with a smile ear to ear on my face. They had stood behind the flywheel and spun it. They put in the time and created a marketing system that acquires customers, builds relationships, increases product usage, and decreases churn. Now that’s a major win for a great SaaS company with incredible marketing traction. Now, what’s stopping YOU from getting started with webinars? David is the co-founder of Demio. He is focused on creating a highly streamlined SaaS company for its users.